Great selection of Top Quality products for Small Conures. Food, treats, cages, stands, perches, feeding dishes, hideaways and much more. Find everything you need to care for your Small Conure right here. Healthy and nutritious food and treats. Spacious and secure cages. Vast array of foraging, interactive and foot toys to keep your Conure stimulated and happy. Choose the perfect perch, feeding dish or supplement for Small Conures. Fast despatched and FREE Delivery on orders over £39! Small Conures are a popular pet among bird owners because of their petite size and pleasant voice. 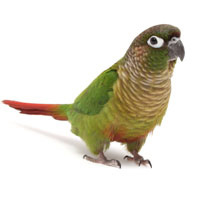 Most commonly owned species include, the Green-Cheeked Conure and Maroon-Bellied Conure. These birds are small, but full of energy and infectious personalities and can make great pets. Since Conures have a lot of energy, despite their size, providing them with a balanced diet, fun toys, and rewarding treats, is essential. Small Conures are always ready to play, so we have a variety of toys that can provide your bird with constant activity and entertainment. We have foraging and teaching toys to develop your pet’s mental ability. All of our toys are made from top quality materials and feature creative designs. When toys no longer keep your bird's interest, try treats and rewards for training. Spoiling your bird for a job well done is an effective way to bond and teach your Small Conure. We recommend trying our Millet treats, a known favourite of Small Conures. When your bird isn’t enjoying our healthy treats, ensure your Small Conure is getting a healthy and nutritious diet. Browse our selection of complete and pelleted food, nuts and seeds, or fruits and vegetables. Not only do we have many high-quality selections to choose from, we also take pride in the fact that our mixes are comprised of high quality ingredients to ensure only the best health benefits for your pet. When your bird has diets needs that need to be supplemented, we can help. All of our supplement products are packed with the right amount of vitamins and minerals to meet your bird’s daily requirements. We have powdered mixes for foods, cleansing sprays to maintain skin health, nut extracts, remedies for basic ailments, and more. When your bird needs “in-cage” time, we have a range of cages to choose from to keep your Small Conure safe and sound. Not only do we offer specially designed, high quality, and multiple cage sizes, but we have plenty of accessories to enrich your bird’s cage. Though we recommend toys, perches, and more, making sure you leave room for your bird to stay active is top priority. For spending time outside of the cage choose one of our stands. Face-to-face interaction with your feathered friend can be great for not only bonding, but to allow them freedom outside of their cage. Finding food, cages, and whatever else you may require raising your Small Conure doesn’t have to be a hassle, we have everything you need.